Red Mountain is a deeply American story of young love, idealism, ignorance, and tragedy, set against a background of changing times in the American South. It is gripping, poignant, and utterly real. Reading this novel, you will feel it as if it were your own life, your own wounds, being lifted up from the well of memory. Charles Entrekin masterfully evokes the great struggles of the early 1960s�the civil rights movement, the anti-war movement, the sexual liberation movement�as they might have been experienced by a sensitive, intelligent young Southern white man who is locked in his own private struggle to escape the constraints of his blue-collar, anti-intellectual background. This fine, deeply felt novel will have a permanent place in the literature documenting the massive upheavals of those tumultuous times. Riveting. As disturbing as it is irresistible. Poet and novelist Charles Entrekin's cast of Southern characters mature in a world rife with racial and sexual tension. Skewered on the horns of their own philosophies, they ultimately come face-to-face with the devastating aftermath of their innocence and insouciance. An absolute page-turner. Red Mountain is a huge accomplishment. It perfectly captures a lost time, the early 1960s in Birmingham and on New York's lower east side. A gifted couple's struggle to nurture love and sanity, their personal story framed by racial violence and family bigotry, is portrayed with the authenticity of memoir, yet shaped through suspenseful, inventive fiction. I loved this novel. —Luke Wallin, author of Conservation Writing: Essays at the Crossroads of Nature and Culture. In Red Mountain, Charles Entrekin writes with an unflinching yet poetic eye, exploring the parallel courses of a nation and a young man forced into maturity. As America's South is plunged into racial insanity, Eddie Anderson must grow beyond the confines of his narrow upbringing; his coming of age includes the tragic descent into madness of his beloved wife. A gripping and enlightening read from someone who lived and breathed and wrote his way through one of America's most tumultuous times. 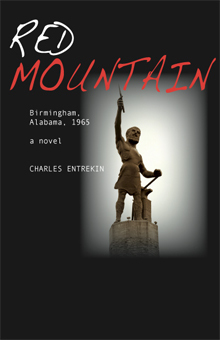 Charles Entrekin, in Red Mountain, rediscovers an important and brave time in recent history, but in a neglected territory; that is, the early 1960s in a backward Birmingham, Alabama (and later in the more familiar terrain of a bohemian New York City.) He describes not only the racism and meanness of the old South, and the squalor and the intoxicating intellectual excitement of New York City; but also, throughout, the recklessness that was so essential to the time of innocence. Every detail is so right, this must have been lived experience. If this wasn't lived experience, it is certainly rendered with a quiet artistic ferocity that makes it seem too real to be made-up. The central story is a love story, of a young man's stalwart fidelity to a young woman, the sort of young woman described in sentimental novels as the "doomed girl living under the curse of a forbidden love." But there's no artificial sentimentality in this story, where the young woman's love truly is of a forbidden sort, and where she is genuinely doomed. Entrekin's narrator practices a restraint�a restraint of judgment, as well as a restraint in prose style�that provides an extraordinary, tender clarity and a wisdom for the illumination of events that, in their time, had little of clarity or wisdom. Red Mountain shows how we're all capable of transcendence and self-transcendence, even in the worst circumstances and among our most hectic mistakes. The south has always been viewed as more conservative as a whole versus the rest of the country - how did they deal with the cultural revolution of the 1960s? "Red Mountain: Birmingham, Alabama, 1965" is the story of a young couple of this era standing against the backwards thinking, ignorance while pushing for their own idealism, love, and sexual liberation, keystones of the era. A brilliantly written period piece, "Red Mountain: Birmingham, Alabama, 1965" is a top pick for community library collections. Born and raised in the Bible Belt, in Birmingham, Alabama, Charles Entrekin has lived in Northern California for more than thirty years. Author of several collections of poetry, including Casting for the Cutthroat, and for two decades managing editor of the Berkeley Poets Workshop & Press, he is currently managing editor of Hip Pocket Press. Red Mountain, Birmingham, Alabama, 1965, is his first novel.